Ban Ki-moon, former UN secretary general, addressing an interfaith climate summit at the Vatican. What would catch your attention? A scientist explaining that “key components of the Earth’s climate system could pass their tipping point this century,” or Pope Francis stating that “we are at the limit! We are on the verge of suicide” with regard to climate change? What strikes you as a plea for justice? A scientist explaining that “climate-related hazards exacerbate other stressors, often with negative outcomes for livelihoods, especially for people living in poverty” or Pope Francis warning that “it is the poorest of the poor who suffer the consequences with the most difficulty!”? Even though those statements describe the same phenomena, you probably found the pope’s message communicating the urgency and injustice of the climate crisis to be more compelling. As an unexpected messenger who makes bold statements in down-to-earth language, Pope Francis is an enthralling climate communicator. The pope also has exceptionally high media visibility and moral authority as an advocate for the poor, making him a powerful icon in the fight for climate justice. Pope Francis’s climate advocacy reached its pinnacle in June 2015 with the release of his groundbreaking encyclical letter Laudato Si’: On Care for our Common Home. An encyclical is the most authoritative teaching document a pope can issue, and Laudato Si’ was addressed not only to the world’s 1.2 billion Catholics but “to all people of good will.” The timing was significant as it was an intentional call for action to governments convening five months later for the 21st Conference of the Parties (COP21) Climate Summit in Paris—the result of twenty-one years of stalled UN negotiations to sign a climate agreement. While scientists and policy makers usually dominate the debates on climate change, the pope’s advocacy helped frame the issue in moral terms relatable to a lay audience. Pope Francis’s leadership indicates that world religions could have a role in the journey ahead to tackle the climate crisis. While the scientific community has compiled unequivocal evidence on how human activities disrupt the climate system, this has not been enough to mobilize global action. The complexity of climate change and the politics surrounding it relegate the issue to a low priority for most citizens and policy makers, even if they are aware of the catastrophic implications. When appealing to people’s minds proves ineffective, speaking to their hearts can provide an alternative means for action. Considering that 84 percent of people globally have a religious affiliation, faith leaders have the potential to become influential allies to the scientific community and make a decisive contribution in motivating humanity to change course. Multiple conferences and publications on the intersection of science, religion, and ecology are testaments to the increased collaboration between the scientific and faith communities in the face of the environmental challenge. Moreover, a commonality of religion and climate science is that they recognize no national boundaries and stress that interconnectedness is at the core of the climate crisis. Science unequivocally emphasizes that the causes and consequences of climate change are blind to country borders. One ton of CO2 has the same warming effect on the global climate regardless of its country of origin, affecting all countries to a certain degree. Meanwhile, the world’s major religions share a concern for the deep ties binding peoples, as illustrated by the writings of Mary Evelyn Tucker and John Grim. “Our planet is a homeland and . . . humanity is one people living in a common home,” said Pope Francis. Both perspectives are critical and must be given consideration, as national boundaries are at the heart of the thorny nature of the UN negotiations. Distrust between geopolitical competitors is a recurrent problem that impedes the cooperation needed to address climate change. Pope Francis has made a decisive contribution in stressing both the urgency and the injustice of the climate crisis. The pope’s emphasis on the urgency contrasts with the business-as-usual operating mode of many politicians. Despite significant progress in scaling up the deployment of renewable energy, most countries continue to subsidize and build new fossil fuel infrastructure, guaranteeing new and sizable carbon emissions for the next few decades. This is in stark contradiction with the extremely ambitious goal of the Paris Agreement to “pursue efforts to limit the temperature increase to 1.5 degrees Celsius above pre-industrial levels,” which requires countries to transition from fossil fuels to clean energy sources in a very short timeframe. All 197 countries agreed to the 1.5 degrees Celsius target because it is the threshold beyond which climate change will likely become catastrophic for many vulnerable communities while exacerbating the risk of crossing planetary “tipping points” that would unleash run-away climate disruption. According to the conservative estimate by the Intergovernmental Panel on Climate Change (IPCC), on a business-as-usual trajectory we would have a 66 percent probability of exceeding the “carbon budget” in just five years, increasing global temperatures beyond the 1.5-degree threshold. Changing course in time to avoid crossing this red line is a massive and urgent undertaking that cannot wait for new technological miracles to arrive in a few decades. The urgency, as Francis reminds us, could not be greater. The head-in-the-sand attitude of many political and economic leaders becomes even more worrisome when we consider the scale of fossil fuel extraction operations. Mainstream data from the fossil fuel industry reveals that mines and wells currently in operation have 2.35 times more carbon than the “carbon budget” to keep temperature increase below the 1.5-degree threshold. In other words, the data suggests that the Paris temperature goal requires the shutdown of 58 percent of the current extraction operations in the fossil fuel industry. The magnitudes are even larger if the wider unexploited reserves are considered—to stay below the 1.5-degree limit, 85 percent of fossil fuel reserves must remain untouched. Pope Francis’s moral authority as an advocate for the poor is an important asset in addressing the social injustice of climate change. The first pope from the developing world, and an Argentine, Pope Francis has put the poor at the core of his agenda. His critique of social injustices and inequitable economic order has gained significant media coverage. As the former archbishop of Buenos Aires, he regularly visited the city’s slums to minister marginalized communities. Pope Francis has drawn attention to the “double injustice of climate change.” The first injustice is that climate change has the largest impact on the poor, who suffer the most from extreme weather events like floods and hurricanes, increasing water scarcity, reductions in crop yields, and rising sea levels that impact coastal cities. 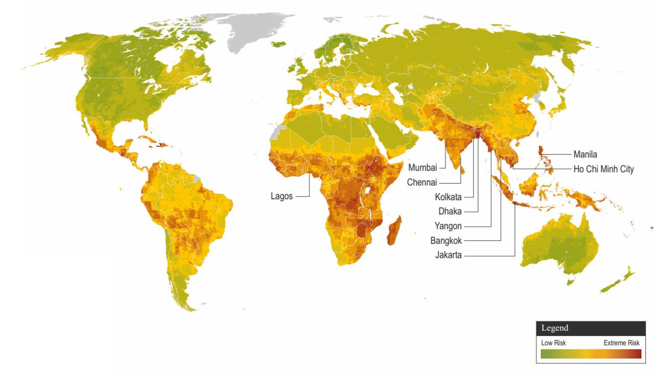 Tropical countries share the commonality of being among the world’s poorest while also being the most vulnerable to climate change, as illustrated in the map below. regions and cities. Source: Maplecroft, 2013. Statements from Pope Francis and other religious groups—like the Islamic Declaration on Climate Change—sought to galvanize the faith community. 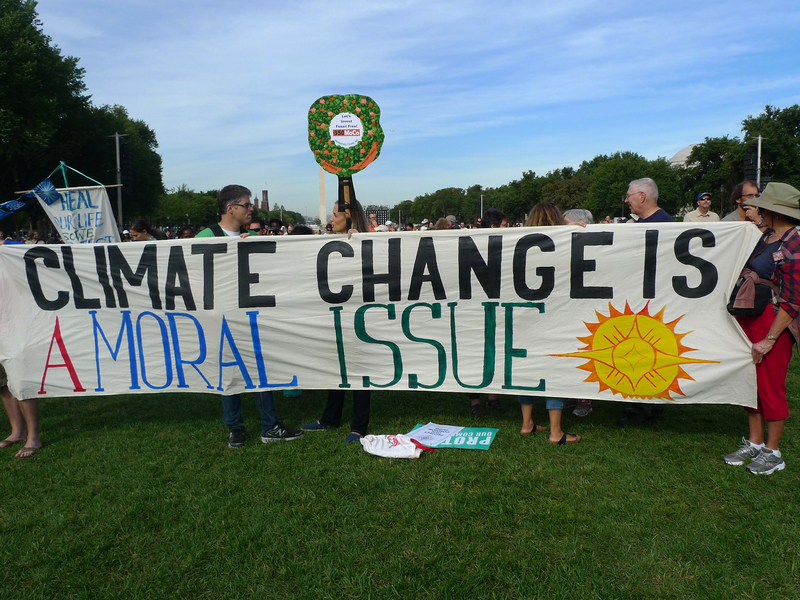 In the run-up to COP21, sizable faith contingents participated in the global climate march of November 2015 and delivered nearly two million petition signatures to COP21 political authorities. “The Pope’s encyclical, along with mobilization by many other faith groups across the globe, provided a clear moral imperative for taking climate action, supporting the Paris Climate Change Agreement,” explained Christiana Figueres, the former United Nations Framework Convention on Climate Change (UNFCCC) executive secretary. As political momentum from COP21 may decline in upcoming rounds of the UN climate negotiations, world religions have an important role to play to demand more courageous action from governments and corporations. Given the exasperating business-as-usual attitude that continues to pervade the response of many governments—exacerbated by the rise of populist politicians like Donald Trump—the faith community must continue its urgent call for climate justice. Faith groups have already been coordinating their joint advocacy at the UN, for example with the 2016 Interfaith Climate Statements. The challenge that remains is coordinating the faith community at national and subnational levels to advocate for local climate action. Ultimately, the faith community needs to remind us about our inherent goodness and our capacity to collaborate as one human family to tackle the common climate challenge. As Pope Francis put it, “Humanity still has the ability to work together in building our common home. . . . Human beings, while capable of the worst, are also capable of rising above themselves, choosing again what is good and making a new start.” In the end, world religions must be tasked with keeping climate hope alive. Tomás Insua is the executive director of the Global Catholic Climate Movement, a network of four hundred Catholic organizations that mobilized nearly one million Catholics for climate justice ahead of the COP21 summit. He also is a research fellow at the John F. Kennedy School of Government at Harvard University, a school from which he graduated with a master’s degree in public administration and where he is an activist with Divest Harvard. Before that, Tomás served in the United Nations Climate Change Secretariat, worked for Google in Latin America and Southeast Asia, and co-founded a faith-based organization doing social justice work in the slums of Buenos Aires. “Secretary-General’s Remarks at Vatican Workshop on the Moral Dimensions of Climate Change and Sustainable Development ‘Protect the Earth, Dignify Humanity’ [As Delivered],” United Nations Secretary-General transcript, 28 April 2015, https://www.un.org/sg/en/content/sg/statement/2015-04-28/secretary-generals-remarks-workshop-moral-dimensions-climate-change. “Tipping Elements In Earth’s Climate System,” Potsdam Institute for Climate Impact Research, ScienceDaily, 7 February 2008, https://www.sciencedaily.com/releases/2008/02/080204172224.htm. “In-Flight Press Conference of His Holiness Pope Francis from the Central African Republic to Rome,” Libreria Editrice Vaticana, 30 November 2015, https://w2.vatican.va/content/francesco/en/speeches/2015/november/documents/papa-francesco_20151130_repubblica-centrafricana-conferenza-stampa.html. IPCC, 2014, “Climate Change 2014: Synthesis Report,” Contribution of Working Groups I, II, and III to the Fifth Assessment Report of the Intergovernmental Panel on Climate Change [Core Writing Team, R.K. Pachauri and L.A. Meyer (eds.)]. IPCC, 2014, 54. https://www.ipcc.ch/pdf/assessment-report/ar5/syr/SYR_AR5_FINAL_full.pdf. “Address of His Holiness Pope Francis to Foundation for Sustainable Development,” Libreria Editrice Vaticana, 11 September 2015, https://w2.vatican.va/content/francesco/en/speeches/2015/september/documents/papa-francesco_20150911_fondazione-sviluppo-sostenibile.html. This encyclical was particularly newsworthy because it was the first time in two thousand years that a pope devoted an encyclical exclusively to ecology. It is important to note that Laudato Si’ is a comprehensive document that examines other socio-ecological issues beyond climate change and develops a holistic moral framework that covers other principles beyond justice toward the poor. As Francis explained, “The important thing is that there be a bit of time between the issuing of the encyclical and the meeting in Paris, so that it can make a contribution . . . Let’s hope that in Paris the delegates will be courageous.” See: http://bit.ly/2iu7sWp. “Scientific consensus: Earth’s climate is warming,” NASA Global Climate Change, accessed 26 February 2017, http://go.nasa.gov/2mdYJWx. “The Global Religious Landscape,” Pew Research Center, 18 December 2012, http://pewrsr.ch/2jXu4if. John Grim and Mary Evelyn Tucker, eds. “Religion and Ecology: Can the Climate Change?,” Daedalus: Journal of the American Academy of Arts and Sciences 130, 2001. Pope Francis, “Laudato Si’: On Care for our Common Home,” Libreria Editrice Vaticana, 164, http://w2.vatican.va/content/francesco/en/encyclicals/documents/papa-francesco_20150524_enciclica-laudato-si.html. Patrick Lynch, “2016 Climate Trends Continue to Break Records,” NASA, 19 July 2016, http://go.nasa.gov/2k1w61g. Pope Francis, “Laudito Si’,” 61. David Coady, Ian Parry, Louis Sears, and Baoping Shang, “How Large Are Global Energy Subsidies?,” (working paper International Monetary Fund Fiscal Affairs Department, 2015). “Adoption of the Paris Agreement,” United Nations Framework Convention on Climate Change, 12 December 2015, https://unfccc.int/resource/docs/2015/cop21/eng/l09r01.pdf. Bill Hare, Niklas Roming, Michiel Schaeffer, and Carl-Friedrich Schleussner, “Implications of the 1.5°C limit in the Paris Agreement for climate policy and decarbonisation,” Climate Analytics, August 2016, http://climateinstitute.org.au/verve/_resources/ClimateAnalytics_Report_FINAL_23082016.pdf. Robert McSweeney and Rosamund Pearce, “Only five years left before 1.5C carbon budget is blown,” CarbonBrief, 19 May 2016, https://www.carbonbrief.org/analysis-only-five-years-left-before-one-point-five-c-budget-is-blown. Greg Muttitt, “The Sky’s Limit: Why the Paris Climate Goals Require a Managed Decline of Fossil Fuel Production,” Oil Change International, 22 September 2016, http://priceofoil.org/2016/09/22/the-skys-limit-report/. The 2.35 figure is a calculation of the 942 Gt CO2 of Emissions from Developed Fossil Fuel Reserves (page 19) divided by the 400 Gt CO2 of the 1.5°C Carbon Budget (page 6). Pope Francis, “Laudato Si’,” 161, 171. Laura Schneider, “Papa argentino: Bergoglio y los curas villeros,” Global Voices, 8 April 2013, https://es.globalvoices.org/2013/04/08/papa-argentino-bergoglio-y-los-curas-villeros/. Pope Francis, “Laudato Si’,” 49. Jean-Pascal van Ypersele, “The Double Injustice of Climate Change,” Université Catholique de Louvain, 26 October 2015, http://www.elic.ucl.ac.be/users/vanyp/Conference2015/talk-JPvanYpersele_Bishops_appeal.pdf. “Maplecroft’s Climate Change and Environmental Risk Atlas,” Verisk Maplecroft, 2013, accessed 26 February 2017, https://maplecroft.com/about/news/ccvi_2013.html. Pope Francis, “Laudato Si’,” 51. “The Carbon Map,” TheCarbonMap, accessed 26 February 2017, http://www.carbonmap.org/#Emissions. “Islamic Declaration on Global Climate Change,” Islamic Foundation for Ecology and Environmental Sciences, http://www.ifees.org.uk/declaration/. “Nearly 2 million people-of-faith petition on the eve of COP21,” The Lutheran World Federation, 29 November 2015, https://www.lutheranworld.org/news/nearly-2-million-people-faith-petition-eve-cop21. “Pope’s Climate Encyclical Raises Action: First Anniversary of “Laudito Si’,” UNFCCC Newsroom, 16 June 2016, http://newsroom.unfccc.int/paris-agreement/first-anniversary-of-pope-francis-encyclical-laudato-si/. “The role of Catholics in the 1.5°C victory at COP21,” Global Catholic Climate Movement, 13 December 2015, http://catholicclimatemovement.global/1-5c-victory/. James Fletcher, “The Role of SIDS and Vulnerable Countries in Influencing Climate Change Negotiations,” Philippines Senate, 15 August 2016, http://www.thecvf.org/wp-content/uploads/sites/18/2016/08/James-Fletcher-Address-at-Inaugural-Lectures-of-Philippines-CVF-South-South-Centre.pdf. “COP 22 Interfaith Climate Statement,” Interfaith Statement 2016, http://www.interfaithstatement2016.org. Partha Dasgupta and Veerabhadran Ramanathan, “Pursuit of the common good,” Science 345, no. 6203 (2014): 1457–58, http://science.sciencemag.org/content/345/6203/1457. Pope Francis, “Laudato Si’,” 56, 78.